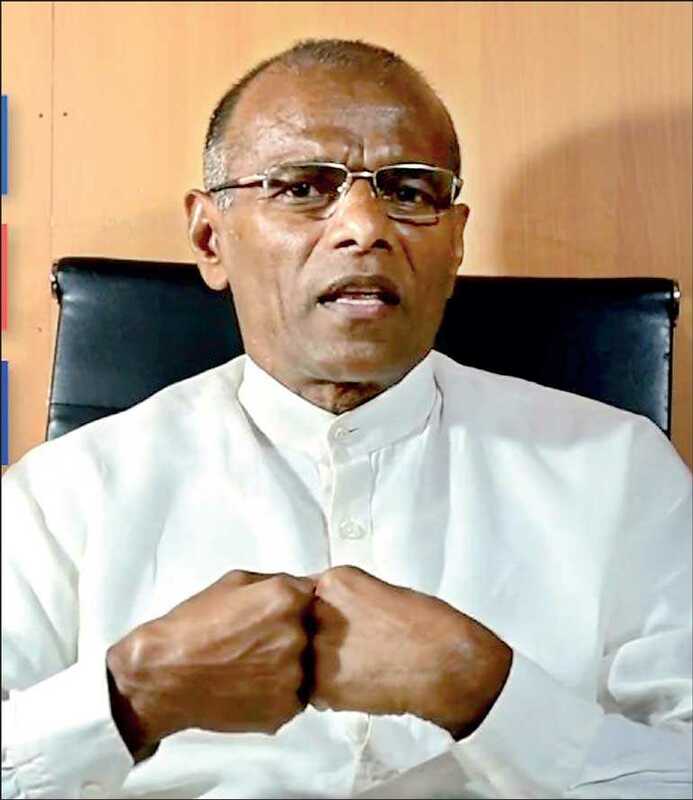 Nagananda Kodituwakku, who can be considered an aggressive public interest litigation activist, in addition to his struggle with the Judiciary has now blasted a ‘constitutional bomb’ which appears to have confused the academics and educated people of Sri Lanka. He has named his constitutional bomb as an “autochthony constitution” or a “home grown constitution”. It can be said that the high tone English catch phrase he had used to name it and also the difficulty in understanding the meaning of it and pronunciation of the word autochthony itself, seem to have made a significant impression on people about Nagananda’s constitution dialogue. He claims that he is engaged in drafting a constitution for Sri Lanka which he will present to the people at the next presidential election which he envisages to contest and if he wins and is elected the president, it will be implemented from that moment itself, on the presumption that the election victory will signify people’s approval for the adoption of the constitution. I am criticising his constitutional theorisation here not with any malicious intention of destroying whatever the recognition he may have gained for his theory, but out of conviction that it would be an offence to the society on my part to keep aloof when such misleading ideas are being socialised. Despite my attempt to explain to him that his approach is wrong on a personal level, he refuses to accept that what he is doing is not right. I spoke to him over the phone and tried to explain to him the mistake he is making. I was not only surprised but also amused by his response. I told him that there wasn’t a single example to be found in the history of constitution making in the world of the type of constitution that he talks about; then I explained to him the accepted principles and traditions being followed in constitution making and advised him that it is wrong to attempt to popularise misleading theories like this among the people without making a proper study of them. The object of my criticism is not to correct Nagananda, but to prevent the people of the country from being misled. Sri Lanka is already in a serious crisis. In order to overcome this crisis we are compelled to go for a system of governance which gives more powers to the people and also to adopt a new constitution. Therefore, in writing this article I have taken the need for making people aware of the constitution and the subject of constitution making itself into consideration. Besides that an attempt has been made to compile it in a manner that would be of use for those studying political science as a subject. Aristotle can be considered the first person to point out that general law and constitutional law are not the same and constitutional law is supreme. The state power of kings under the feudal system of monarchies was considered to have been bestowed by God. Thomas Hobbes (1511-1769) was the philosopher who founded this principle. On the other hand, John Locke (1632-1704) was the first philosopher to introduce the principle that the state derives its power not from god, but from the people. According to him, the sovereignty of the state rests on the people. The constitution should be considered only as an agreement entered into between the ruler and the ruled. These two factors can be described as the two main principles which had a significant impact on the spheres of democratic politics, governance and constitution making. Though there have been various later developments in this political and philosophical approach, it can be said that all democratic systems of governance have been built on these principles. The United Kingdom (Britain) can be described as the most prominent political centre which had produced the most important concepts and traditions in the field of governance over a very long period of 1,400 years. The system of governance of the UK is an outcome of a historical evolution of about 1,400 years, which can be considered an entity that had developed innately. The UK is one of the five countries which does not have a written constitution. Canada, New Zealand, Israel and Saudi Arabia are the other four countries which do not have written constitutions. Though these countries do not have formally-written constitutions, they of course have numerous laws and regulations pertaining to their system of governance. The United Kingdom has a written as well as unwritten section of its constitution. The written section consists of covenants, petitions, fundamental acts of a Legislature, court cases, treaties and judgments and also an excellent set of books written on governance, etc. The unwritten section consists of traditions and common law. The USA can be considered the first country to have adopted a written constitution following the policy of liberalism to the letter. It was adopted in 1784. Since then, the number of written constitutions adopted by various countries can be more than 200. In almost every country in which a democratic system of government is in force, their constitutions have been adopted by a constituent assembly comprising people’s representatives or by the Legislature. Constitution making being a process that pertains to the supremacy of the people, all countries except Japan have adopted their constitutions through a constituent assembly or the Legislature. People’s participatory constitution making is the most acknowledged model in the 21st century, in which people are actively involved in the constitution-making process. Only Japan is an exception to this tradition. Following the defeat of Japan in World War II, Douglas Macarthur was appointed the Supreme Commander for the Allied Powers (SCAP). He was entrusted with the major responsibility of ensuring that Japan would not be a threat to world peace and security in the future and establishing a responsible government for Japan. Supreme Commander Douglas Macarthur requested the Japanese Prime Minister to draft a new constitution. The Prime Minister had been of the view that Japan had a good constitution; hence there was no need for a new one. Ruling out his contention, Macarthur ordered the Prime Minister to draft a new constitution. Accordingly, a committee comprising members of the Legislature was appointed and a draft was prepared. However, Macarthur was not pleased with it and got the staff of his headquarters to draft the constitution. After it was ratified and approved by both houses of the Diet and with the approval of the Emperor, the present Constitution of Japan came into effect on 3 May 1947. All these examples demonstrate that nowhere in the world has a constitution drafted by an individual been adopted as the constitution of the country, consequent to it being presented at an election and considering his victory in the election as a mandate given by the people to implement it. Even Hitler, considered to be one of the most ruthless dictators, did not attempt such a thing. What Hitler did was to amend certain clauses pertains to citizens’ security in the Weimar Constitution of the German Reich, adopted after World War I, with the approval of the Legislature following his ascension to power in 1933. I wish to state that the methodology envisaged to be employed by Nagananda is not only anti-democratic and anti-constitutional but also a weird and misleading system. Such a system, in addition to making the country an object of contempt of the whole world, will invariably make the system of governance of the country, which is already in a deep confusion, a grotesque mockery. Presuming that a situation is created in which the constitution of the country is adopted on the basis of a draft constitution formulated and presented by a candidate to a major election as suggested by Nagananda, it will invariably set a precedent for the next person coming to power to repeat the same thing. If that happens Sri Lanka will become a hilarious country in which the constitution of the country changes every time the government changes and a new leader assumes power. Usually a constitution, the supreme law of a country, is made for long-term use. It is not a short-term exercise. The American Constitution is 230 years old. The Norwegian Constitution is 205 years old. The Constitution of Switzerland is 171 years old. If the system proposed by Nagananda is established, Sri Lanka will become a country which makes a new constitution every five years and whenever the government changes. It is not only the content of a constitution that matters most. The way it is adopted is also equally important. Openness and people’s participation are considered to be the two main important elements in the making of people’s participatory constitutions which is the most accepted constitution-making model in the 21st century. It implies that all activities involved in the process of making a constitution, from its beginning to the final conclusion, ought to be transparent and the public must have the right to take part in the process throughout. Now let us look at Naganada’s autochthony or home grown constitution. At a glance it appears to be a term not so easy to understand and pronounce. Autochthony is a Greek word; its simple meaning is local or sprung from earth itself or “home grown”. This term is used in making constitutions for countries which had gained independence from colonial rule, but still having legal ties with the colonial crown. Autochthony constitutions are adopted to free these countries from legal bindings to the former imperial predecessors. The legal philosophy of autochthony was propounded by Hans Kelsen, (1881-1973). He is considered to be the founder of the Austrian Constitution. The colonial masters, when granting independence to their subject nations, did it in a manner that ensured the imperial predecessor’s constitution would continue to be at the helm of the legal system of the newly-liberated former colonies despite the legal transfer of power, mainly because the transfer of power was recognised as ‘legal’ by the constitution of the imperial predecessor. This resulted in the freed nations still having legal bindings to the former masters even after gaining independence. Thus, according to the constitution used or the rules applied for granting independence, those countries were compelled to be guided by the old constitution that they inherited at the time of gaining independence if they were to make a new constitution for their countries. This posed a serious problem in making them free of the legal ties they had to the crown or the imperial predecessors. In this backdrop, the newly-independent countries had a necessity to deviate from the existing system of constitution making and adopt a new system to free themselves from all legal bindings to the crown or the imperial predecessor. Hans was the theoretician who pointed out an alternate way for making a constitution. He pointed out that it would be possible to transfer from an existing legal system to a completely new legal system through a purely legal process which he termed autochthony constitution. As a result of the struggle by the people of South Ireland to be free from Britain, Ireland was granted freedom by the Anglo-Irish Treaty in 1922. But, according to the constitution formulated upon granting independence to Southern Ireland, it still had legal ties, a legal continuity with the British Crown. Though it was a nominal binding, it was not to the liking of the Irish leaders. By several acts passed by the Irish Legislature in 1933, Southern Ireland ceded legal ties with Britain. But, Britain did not obstruct this move. Thereafter, Ireland made a new constitution in 1937 superimposing the 1922 Constitution. India can be considered the country which implemented Han’s theory in a formal manner. The British formally granted independence to India by the enactment of the Indian Independence Act 1947. Though it had legally recognised India’s right to make a constitution, it required to be put to the British Legislature for approval. But India did not follow the conditions of the Indian Independence Act. Instead, following the Irish precedent, what India did was appoint a formal Constituent Assembly and adopt a new constitution ceding all the legal bindings to the British Crown and vesting sovereignty with the people of India. In the field of constitution making, the term autochthony is used to describe constitution-making systems adopted to break away from legal bindings to foreign powers by deviating from the existing frame of constitution. It is not an arbitrary system like what Nagananda had construed it, by which the constitution of the country is adopted by presenting a draft constitution formulated by him at a major election which he intends to contest and treating the public vote as a mandate given for implementation of it in the event he wins the election. The autochthony constitution proposed by Nagananda can be described as a system which is ugly and lacks propriety and will push the country into a constitutional chaos by prompting every ruler that comes to power to introduce a constitution of his wish. Nagananda is an aggressive fighter, but his vision of a new constitution can be considered extremely backward and regressive.